A good burger with some good beer = a good time. 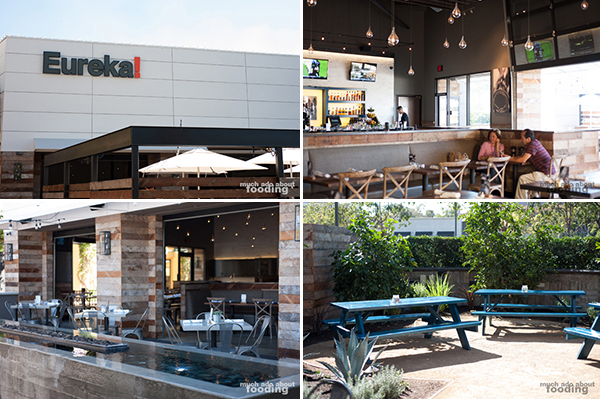 When LA-based Eureka established its first OC location in Huntington Beach at Bella Terra, we were interested to see what they could bring to the Orange County restaurant scene that we did not already have. The concept of having American craft beers and 100% grass-fed beef burgers didn't strike us as out of the ordinary but the execution cemented its popularity with the community. Along with an impressive selection of whiskeys, the restaurant makes a mean burger so it was came as no surprise that it was expanding. The next spot was Irvine at the University Town Center (UTC) - that one popped up quickly so it wasn't long before we made it in. 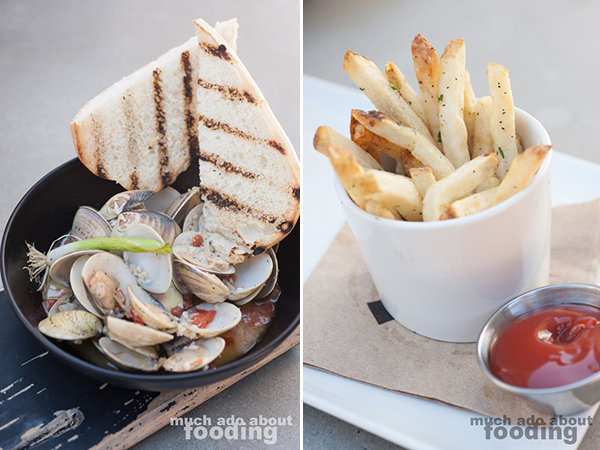 Upon invitation, we visited to see how it was laid out, if any different from the Huntington Beach one, and try out the new menu items that were released approximately the same time that Irvine opened. The juxtaposition of this UTC by a major university - University of California, Irvine (UCI) - instead of a community college - Goldenwest College - was a smart business move. It looks like they have a habit of setting up shop near colleges and with good reason. 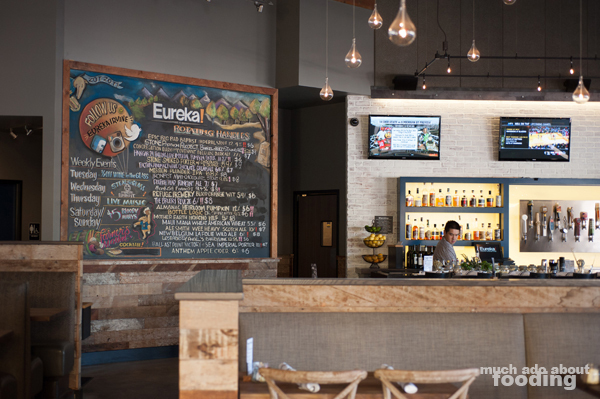 The menu is geared towards a younger crowd who is not afraid to spend a little more on beer. Also by both locations being in large shopping centers, they can capture those wandering about. What sets Irvine's location apart from the OC flagship is the inclusion of a benched, offset area where private events may be held. This permits more gatherings and gives more reason for people to rent out the entire patio area. There is also an extension to their "Hoppy" Hour ($2 off draft beer, botttled beer, wine, and select spirits and discounted appetizers) here with a late night slot of 9pm to close. After admiring the space which has the same feel of a Eureka restaurant but incorporates some Irvine elements such as more greenery outside and high ceilings, we looked at their cocktail menu which has expanded since we last saw it. 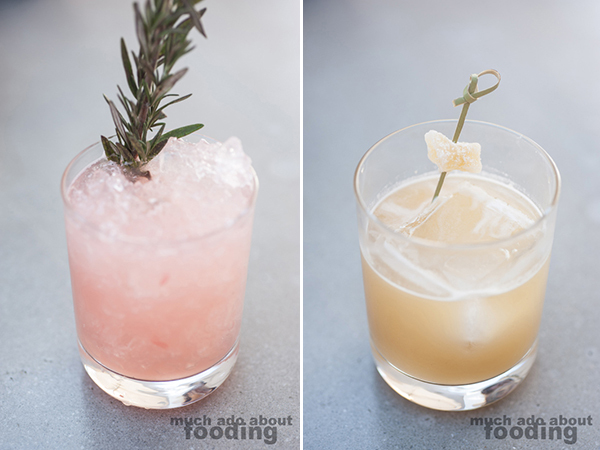 Separated into sections labeled The Original Classics and Contemporary Creations, the cocktail menu has had several additions with actual names this time instead of taste profiles. I went for the Rosemary's Ruby Red ($10 - gin, rosemary, grapefruit, and citrus) which came with an absurdly tall rosemary twig, and Duc chose the Penicillin ($13 - smoked whiskey, ginger, honey, and citrus). The Rosemary Ruby Red was refreshing and heavy on the grapefruit, a good choice for someone who likes the bitter-tart citrus fruit. The Penicillin arrived with a charming cube of candied ginger to highlight the ginger in the drink but fell a little short of the whiskey forwardness we had hoped for. It seemed more citrus juice than not. The variety of starters is enough to make you stick with one or two for your meal, and while we are fans of several of Eureka's offerings, we decided it was time to try something different. So to begin, we ordered their Steamers ($15 - Manila clams, garlic, herbs, sherry, and grilled ciabatta), a get-your-hands-a-little-dirty type of dish but one with good reason. The sauce was fantastic, and we sopped it up readily with the ciabatta. However, with the amount of clams in the starter, I am not too sure many would want to shell out $15 for the lot. If you do though, you're in for a treat because the garlicky flavor carries through into the clam meat well. As always, they make decent fries that come standard with every burger. If you are a sweet potatoes person though, Eureka does make one of our favorite sweet potato fries to date and it can substitute the fries for an add-on cost. We got these fries when we ordered the Bone Marrow Burger ($16.50 - bone marrow porcini, charbroiled onion, mustard aioli, oven-roasted tomato, and signature handcut fries), a new addition to their line of burgers. The patties here are great so it was no surprise that this burger's beef patty was executed as well as we remembered. However, that was where it sort of ended that lunch in terms of satisfaction. 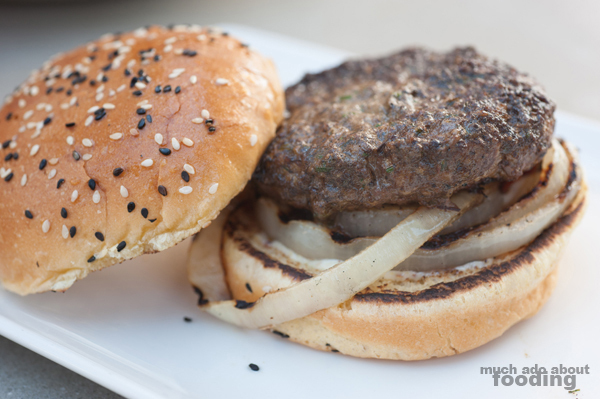 The bottom bun got soggy quickly, making the burger difficult to pick up toward the end, and the charbroiled onion took over a lot of the taste. The bone marrow porcini was practically imperceptible which surprised both of us considering how strong porcini typically is. I hope that this was just a flaw in the one burger we had when it comes to this dish though because the concept sounds divine; who wouldn't want bone marrow and savory mushroom? 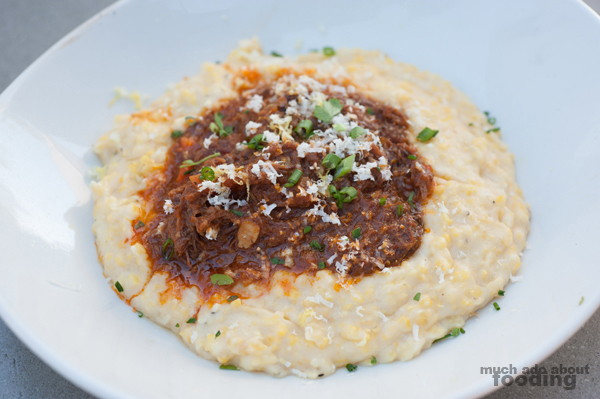 The second entree, Short Rib Ragu ($16 - stone-ground grits, shaved horseradish, and herbs), had some good and bad as well. Instead of being creamy and smooth, the grits were chunky and took a while to get through. For a ragu, the dish was quite sweet so opt for this if you prefer a sweeter ragu; I did enjoy the usage of short rib though because it was tender and hefty. The shaved horseradish was a delightful and unique touch to it all, lending its sharp twang to the richness of the ragu. 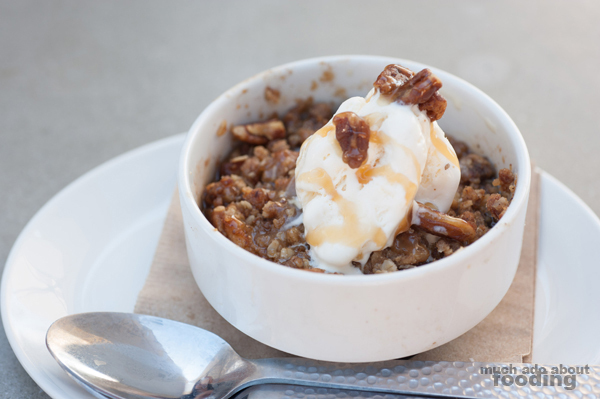 Our several previous visits had shown us that we were huge fans of both of Eureka's two desserts so we were excited for their newest - the Americana Apple Crisp ($6 - caramelized apples, pecan oat crisp, and vanilla bean ice cream). Our portion that afternoon was sloppy unfortunately and overly sweet. The oat crisp was too saturated in its honeyed binder and thus, mushy. The caramelized apples were good on their own, especially with the vanilla bean ice cream but we were disappointed with how the scoop came out already partially melted. Perhaps it had sat out too long? My suggestion is to go for their solid original options because their butterscotch pudding is simply perfect. Overall, the new menu items did not wow us as we had hoped but steadfast ones have so go for the burgers and get yourself a brew!